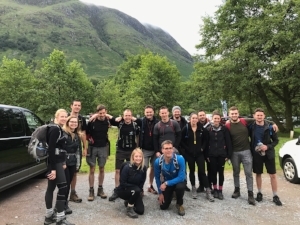 This year, an amazing group of staff from international recruitment organisation Experis took park in the gruelling Three Peaks Challenge on behalf of Aid Box Community. 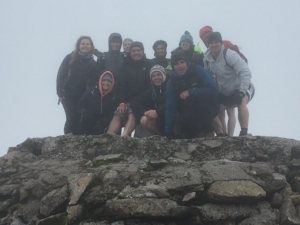 In total, the team of more than 20 raised an incredible £8,000! Dugald McIntosh who took part in the epic hike explains the highs and lows of taking on Britain’s highest mountains. Q: Why did Experis choose to support Aid Box Community? A: Every year Experis selects a charity to support and in 2016, with the refugee crisis in the news, supporting an organisation which was making such a direct and positive impact made a lot of sense. Q: Who took part in the event? A: We do one or two big fundraising events a year and the company pays the costs of the event. 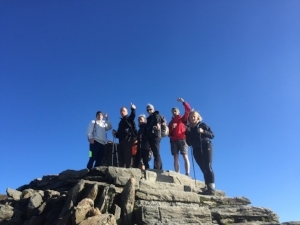 We expect employees to take part to raise a minimum amount of money for our charity so we try to select an event which is challenging but inclusive as we want our employees to be able to get on board. We were overwhelmed by the response for this event and so picked a selection from different offices and teams, as this was also an opportunity for our employees to get to know one another better and feel part of something unique. Q: Why did you choose to do the Three Peaks? 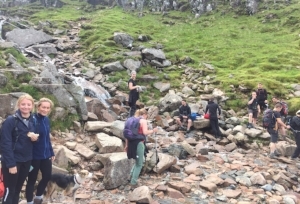 A The Three Peaks is a great challenge as physically most people can do it with training. It’s also very recognisable and achievable as a challenge and it’s all over in 48 hours. Q: How long did it take you to plan? Were there any specific challenges you needed to overcome and how much training did you do? A: We started at least three months before to give everyone the opportunity to prepare, train and, crucially, raise money. We asked for a volunteer to project manage the challenge, which gave one of our junior employees some great new experience and exposure. Another tip is get executive support. They can make things happen and approve expenses along the way. It’s quite a lot of work to get 20+ people from work back to their homes via three mountains. You need to transport them, feed them, keep them safe – and preferably happy! 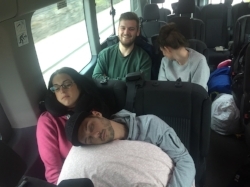 Q: Three mountains in three days is a remarkable feat – what was the experience like? A: The key word about something like this is ‘challenge’! You can prepare and train and think it through but until you’re out there doing it you don’t quite know what will happen. People have very different levels of fitness so you have to take that into consideration and make sure everyone is ok.
And, contrary to what you might think, it’s not the climbing that kills you, it’s the driving through the night! It’s pretty gruelling and by the end everyone was very tired, but the feeling of accomplishment was immense and well worth any temporary hardship. Q: How much money did you raise? A: The final count is just over £8000. Q: What was the main thing you learned from the experience? A: Our challenge was nothing compared to what refugees face every day. We helped raise some money for Aid Box but I think the return for us was far greater as we were able put some perspective on our own lives and build stronger, better teams.